Thompson-Boling Arena opened in 1987 on the banks of the Tennessee River. When it first opened it held over 24,000 fans. In 2007 the arena was renovated and brought the capacity to 21,678, third highest capacity for an on-campus arena. 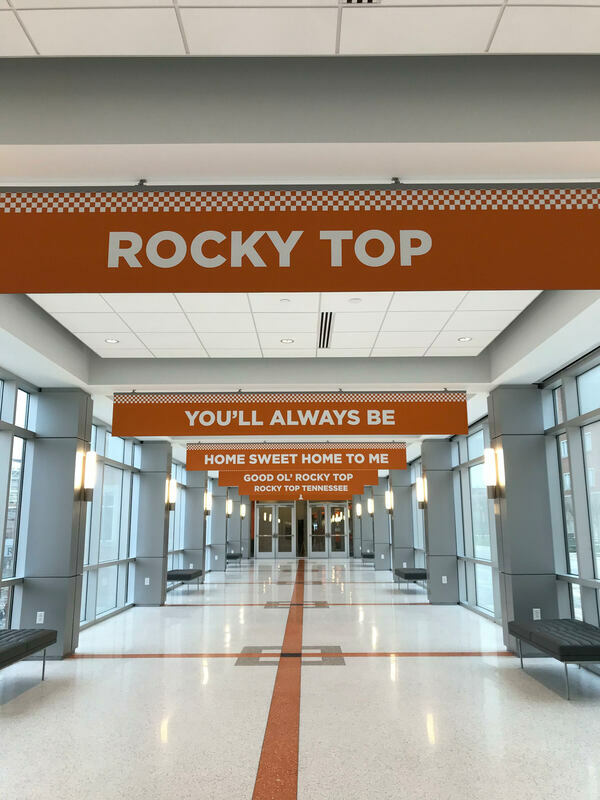 TBA is home to the men's and women's basketball teams as well as the volleyball team. The arena is split into two sections, upper and lower level. They are both serviced by one concourse. The concourse pays tribute to former Vol basketball players throughout. It features 8 restrooms and 6 concession stands. The lower and upper levels feature black chairback seating. The lower level features the student section plus 166 loge seats. The Loge seats are leather and are separated into 7 sections. Each section features a flat-screen TV. The upper level has 32 suites on the north side of the venue. The suites were added during the 2007 renovation. This level has two video boards and two scoreboards located at the corners of the arena. The drop-down scoreboard came in phase I of the renovations at a cost of 3 million dollars. It has two 360 ribbons, 4 large boards, and 4 medium sized boards. 1. Check out World Fair Park right next to campus! Yes, the golden ball is located there. 2. ​Head over to the “Strip” located on Cumberland Avenue. There are plenty of bars, restaurants, and fast food options for all ages. 3. The new Student Union is a must see plus the bookstore is located here. 4. Take a picture with the Pat Summit statue located right next to the arena. Thompson-Boling Arena: Not much has changed since my last visit 8 years ago. The venue still earns high marks. The decision to ditch bleacher seats for chairbacks throughout the whole arena was before it's time. That recently has become more and more trendy. I love the wall of suites, it gives the arena a unique look compared to most in College Basketball venues. This arena still remains one of the best that I visited and I don't see that changing anytime soon. 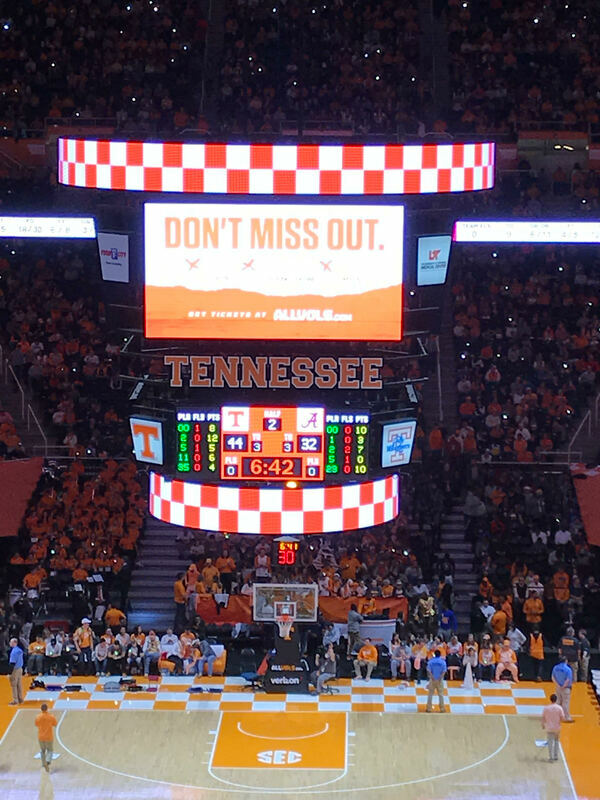 Two big issues with TBA. One issue is that TBA has one concourse for 21,000 fans. A second concourse would elevate this arena to another level. That may be a pretty extensive renovation though. 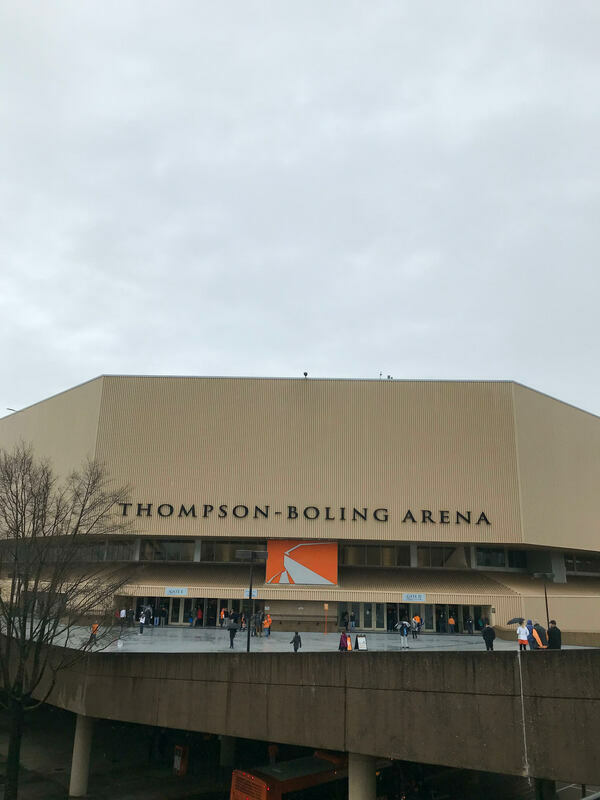 The second issue is the exterior of the arena makes Thompson-Boling look run down. It gives you the feeling that the wooden benches may still be inside the arena. The concourse, in general, could use a refresh. Same with the banners in the rafters. Majority of them look the same from my first visit. Scoreboard: The only thing they need to upgrade is the two scoreboards that keep player stats. They need to be changed over to video boards. That will provide more options for fans then just your basic scoreboard. 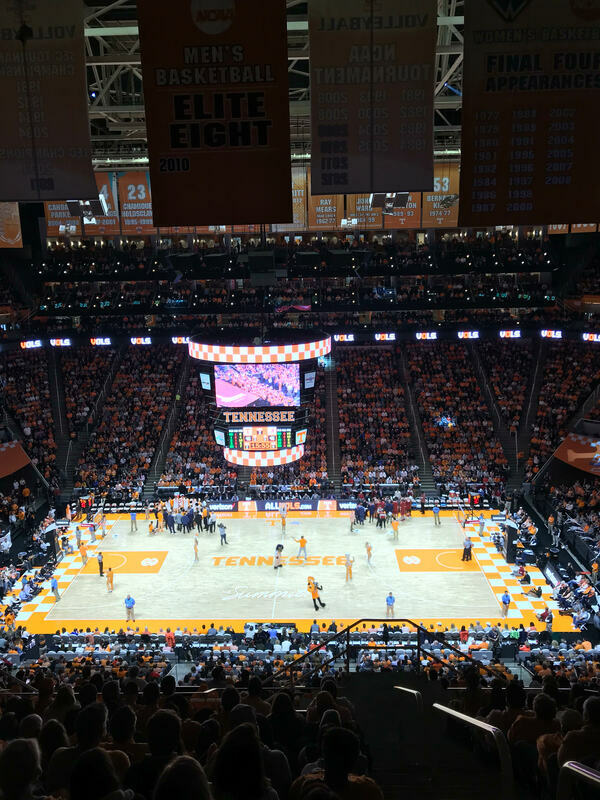 Atmosphere: Having been to three games now I have a pretty good feel for the atmosphere at Thompson-Boling Arena. The Memphis game featured bad weather so that was kind of a wash. The Kentucky game was the best. Kentucky will always best the best game to attend. The Alabama game was sold out but didn't have a top-level atmosphere throughout the game. From the Alabama game, the biggest thing that was missing was the presence of the student section. Outside of the section right behind the basket, they weren't engaged. ​Section 129 was on their feet the whole game, the rest of the students were sitting. Maybe, there is a reason for that? I doubt it though. The student section is the pulse of the arena, they have to do better. Campus: The campus was a downfall for me in the past but they have made a lot of strides since I first reviewed the campus back in 2011. They have put a primary focus on updating everything around Neyland Stadium. The past Student Union building was an embarrassment. Now Vol Nation has something to be proud of. The complete rebuild brings the University of Tennessee into modern times. Many more upgrades have elevated campus life to another level. My former rating for the campus was a 7. I might have been kind when I gave that rating. The biggest flaw with the campus is the amount of car traffic that flows through the campus. You can never get away from it. They still have a few eyesores along the way but it is getting much better. For those traveling to the campus and want to see the top features here's a list. Student Union-A must-see on campus! Neyland Stadium-Home of the Vol Football team. Ayres Hall-Most iconic building on campus. You can find it on "The Hill". 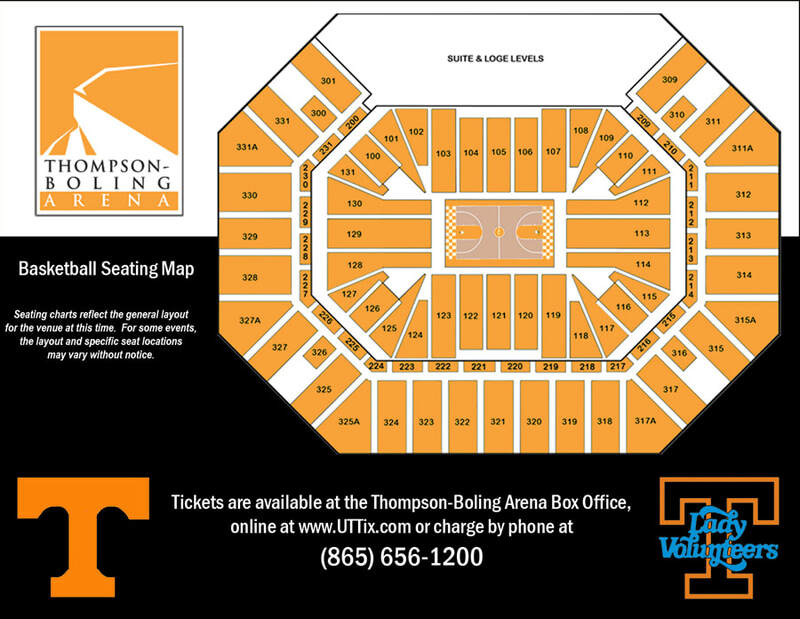 What do you rate Thompson-Boling Arena?